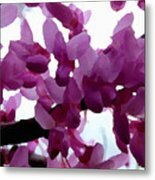 One of my favorite flowers is the cute and funny little pink redbud blossoms. 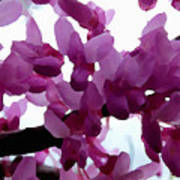 The Redbud tree is the state tree here in Oklahoma and one of the first things to bloom in the spring. These comical little flowers pop out even before any leaf buds come on and have a shape that looks sort of like big pink eared bunnies. 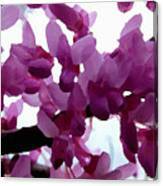 Another distinctive trait of this wonderful tree is the heart shaped leaves that grow right after the spring bloom. I made this digital painting from my own photograph. Thank you for visiting my gallery and if you make a purchase I would like to thank you for supporting this independent artist! I am an artist from the womb. It is a talent and a gift God gave me. 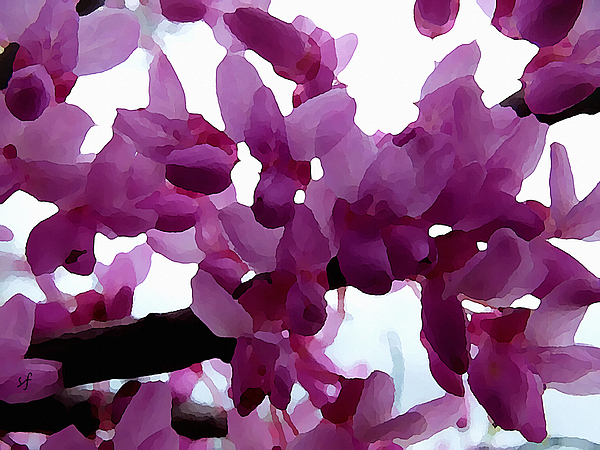 I specialize in digital art, botanical, abstracts and photo manipulation with an emphasis on light and color. I try to focus less on exact details and more on impressions and feelings. You will see the influence of my favorite styles in my work such as post impressionist, expressionist and also modern digital techniques like glitch art and abstracts.